We opened SOUTHSIDE WITH YOU this weekend – the charming and inspiring film about Barack & Michelle Obama’s first date…and we still have HUNT FOR THE WILDERPEOPLE and INDIGNATION for a couple more days (Thursday will be your last chance to catch them at THE NEON). Synopsis for SOUTHSIDE WITH YOU : From executive producer John Legend comes a charming and inspiring film about a wonderful couple. 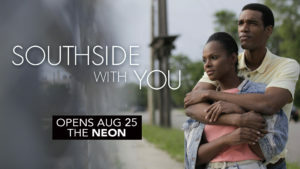 “Inspired by Barack and Michelle Obama’s first date, SOUTHSIDE WITH YOU recounts the eventful summer day in 1989 when a young law firm associate named Barack Obama (Parker Sawyers) tried to woo lawyer Michelle Robinson (Tika Sumpter) during a daylong date that took them from the Art Institute of Chicago to a screening of Spike Lee’s DO THE RIGHT THING to the site of their first kiss outside of an ice cream parlor.” (taken from Roadside Attractions) Click this LINK to visit the film’s official site. YARN ticket sales have passed the threshold and the screening will move forward as planned! The Miami Valley Knitting Guild is bringing the film YARN to town on Wednesday, August 31 at 7:30. ” Meet the artists who are redefining the tradition of knit and crochet, bringing yarn out of the house and into the world. Reinventing our relationship with this colorful tradition, YARN weaves together wool graffiti artists, circus performers, and structural designers into a visually-striking look at the women who are making a creative stance while building one of modern art’s hottest trends.” Click this LINK to reserve your advanced ticket. If tickets remain, they will be available at our box office one hour before the screening. “Join us for a special screening of 91%: A Film About Guns in America. A film collaboration between John Richie and Dayton Native Ian Cook. 91% is a documentary that examines U.S. gun policies with a focus on the background check system. 91% of Americans are for background checks on all gun sales, yet Congress continues to fail to close the loophole. Why is that and how does that undermine our public safety? The hour long film will be followed by a discussion afterwards. Please join us for this important event!” (taken from 91% press notes) This film will screen on Sunday, September 4 at 7:30, and tickets are now on sale at THE NEON’s box office – traditional ticket prices apply. “NEON Lumbar Supporter” Update: Amazing news! We made our Goal!!! Replacing our 30 year-old chairs will cost us $50,000, and we hoped to raise at least half of that through your generous donations. As of this weekend, we have sold 113 chairs at $250 each! Thank you, Thank you, Thank you!! You can read all about this project by clicking this LINK, and we’ll keep the campaign running until the end of August. Donations can be accepted on-line, but we can also take donations in person — where we’d love to chat with you about the new chairs and have you try out the samples in our lobby. We’ve had many requests for the new film from Mike Birbiglia – DON’T THINK TWICE. I’m happy to let you know that this new comedy (rated “99% Fresh” on rottentomatoes) is slated to open Sept. 9! EQUITY – a film about women on Wall Street – opens Friday! !